Click on the VIRTUAL TOUR LINK to see a professional video! Curb appeal! 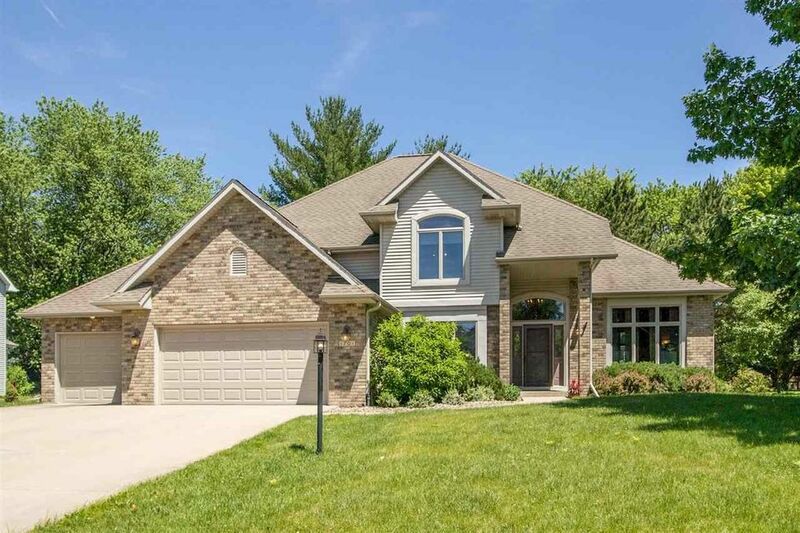 Attractive 2 story home in N. Coralville’s Timber Addition with some wonderful recent improvements and located in a private wooded setting! There is a great kitchen that boasts solid Cherry Brookhaven wood cabinetry, newer appliances including a GE Profile French door style refrigerator, induction range, double ovens, built-in buffet, great counter space including a raised breakfast bar and a shiny copper hood vent; sunken 1st floor family room featuring a granite fireplace; gracious formal dining; main floor study or 5th bedroom accented with French doors; 1st floor laundry room that includes the newer GE front load washer/dryer; luxury vinyl tile flooring through most of the main level; 4 upper level bedrooms including a 15x18 double door entry master suite; nicely finished lower level with an incredible new wet bar equipped with glass door cabinetry and a special Sub Zero refrigerator and freezer; theater system with projector, 120 inch screen and built-in speakers (components are reserved). More special features include 9 ft. and 10 ft. ceilings plus a 2 story entry with open staircase; oversized 734 sq. ft. (3) car garage with built-in shelving; Andersen Windows; aggregate concrete patio; security system; reverse osmosis drinking system; central vacuum; lots of unfinished storage space with built-in shelving; finished wine cellar; multi-zoned HVAC system; 2 newer high efficiency furnaces and air conditioners with UV light filtration; invisible dog fence; Rainbow play structure; new lower level carpet; and new overhead garage doors and openers.